Nottinghamshire has two teams in Division 3 of the Four Nations Chess League (4NCL). Games are played on weekends throughout the season. With several players either permanently or temporarily unavailable this season, finding players for the first pair of matches – which happened also to be the only long-distance trip of the season – proved interesting, especially for the new captain. In the end, with some assistance from Neil Graham in particular, I was able to add three players to the squad: West Nottingham's latest French star (Mathieu Tournier), former Notts player Mark Jones (now living in Swindon), and – at the last minute – Robert Willoughby. The new boys had a mixed day. Mathieu held a significant advantage as Notts 1 took on Poisoned Pawns 2 in a very evenly balanced match. Unfortunately he was unable to force the win – a fate that also befell Andy Walker and me. It was cruel, therefore, that with five of us drawing a miscalculation by Mark decided the result in the opposition's favour. A 50:50 match going the wrong way is hardly a disaster, of course. Notts 2, however, didn't have the luxury of a roughly even contest. Conceding an average of 281 rating points per board to Guildford A&DC 4, anything other than a whitewash could be considered a success. For a while things looked quite promising, but one by one the zeros started to appear on the scoresheet. In the end it was the third of the debutants who scored the solitary half point, Robert narrowly failing to beat his much higher rated opponent. Possibly the last thing any of us needed after a day of six draws and six defeats was to be woken by a fire alarm at 3:00 a.m. on Sunday morning. With a loudspeaker blaring out instructions to get out of the building as quickly as possible, we (and all the other players staying overnight) staggered out of the building in various states of dishevelment. One or two (but none of us, I'm glad to say) had taken the order to leave immediately at face value and were wearing only the bare minimum – not a pretty sight. Fortunately, it was a false alarm, so we all trudged back in and tried to get back to sleep. Notts 2 received another tough pairing – SCS – but this time the rating difference was a more manageable 51 points per board. Brian Thompson registered an excellent draw with Black on top board, featuring an amazing rook sacrifice. With a win for Stan Cranmer and a draw for Neil Graham things were looking good. Boards 4 and 5 didn't turn out so well though, leaving Robert to try to pull things round. He had a sizeable advantage as the time control approached, but was very short of time – about four minutes for his last 12 moves. His opponent, however, was struggling to defend, and gradually the clock times grew closer together. I left the playing hall when the players were down to about two minutes each – I hate watching that kind of time scramble. Five minutes later I went back in to find that Robert had reached a completely winning position and had won on time, salvaging a draw for the team. The next two rounds, on 6 and 7 December, should be fun. All three divisions will be playing that weekend, so there'll be grandmaster chess to watch. A rarity: all three divisions playing in the same venue on the same weekend. We third division hackers therefore got to rub shoulders (almost literally) with a large number of Britain’s best players. I lost count of the number of GMs present, but here’s a selection of names to convey the flavour of the event: Speelman, Howell, Chandler, Conquest, Hebden, Rowson, Flear, Wells, Davies... the list goes on! So how did the Nottinghamshire contingent fare alongside such August company? Nottinghamshire 1 received an unexpected gift from Round 3 opponents The Full Ponty in the form of a default on Board 6. We were notified in advance, so no one had to make a wasted trip. Very quickly the score moved to 2–0, when Alex Combie, making his debut, turned what looked like an exercise in pawn grabbing into an overwhelming kingside attack. All was well on the other boards and a big score looked possible, but it didn’t quite materialise. 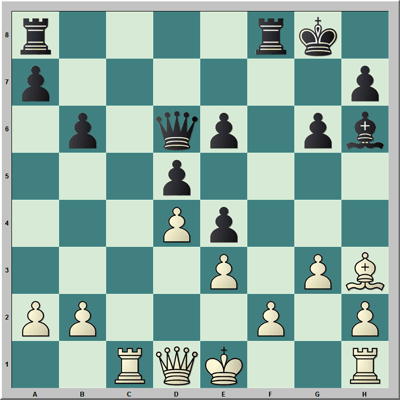 I overcame a slight disadvantage from the opening and forced a repetition in a knight endgame; David Levens’ position never quite delivered on its apparent promise; and Richard Truman’s extra pawn never came to anything. With the match won, Rob Richmond was left to try to find a win in what looked like a level position, but it too proved elusive. The second team had the misfortune to be paired against Warwickshire Select 2, conceding around 170 rating points per board. Brian Thompson and Richard Myers did well to draw (in fact, Richard missed a win), but the opposition proved too strong overall. Maurice Hill came closest to adding a half-point, but he eventually succumbed in a long rook ending. Board orders were shuffled to avoid players receiving the same colour on both days, but whether or not this influenced the results is hard to say. Against Bristol 2 the first team started well, with a quick draw for Alex and an easy win for me (finally ending an eight-game drawing streak in the competition). But then things started to go badly. Richard dropped a pawn for nothing and was well beaten; David was under a little pressure; and Rob had also lost a pawn. The best hope for a win seemed to be Andy Walker’s game, but that came to nothing, and when Rob failed to hold his position it was left to David to try to level the match. He reached an advantageous endgame, but the one fleeting winning chance slipped by. Notts 2 looked like they were facing another beating against Mind Sports, but they rose to the occasion. Neil Graham took an early draw, after which two defeats made the situation look grim. The key game was Bob Taylor’s on Board 1. About halfway through he assessed his position as ‘desperate’, but a little while later he reached an endgame with a piece for two pawns and his technique proved secure enough to deliver the point against a much higher-rated opponent. Richard was grinding out his second draw of the weekend, so the match came down to Robert Willoughby’s apparently easy game on bottom board. Typically, of course, his opponent played well above her notional strength, and at one point appeared to have prospects of a perpetual check. But Robert eventually extricated his king and brought home the point to level the match. The Executive Committee is likely to confirm that the teams' entry fees for this season will be paid by charging a board fee of �2.50 per game played (applied retrospectively). Update: a board fee of �3.00 was set, with the first weekend not charged for. With snow forecast, the 4NCL management put in place a few emergency rules for the third set of matches. Players could arrive up to two hours late if affected by the weather, and would then play a five-hour session instead of seven hours. Team captains would be allowed to keep their mobile phones on until all their players had arrived. As it turned out, apart from two teams that opted not to travel just about everyone was present in good time. Nottinghamshire 1 might have wished otherwise though. David Levens made a slip coming out of the opening and fell to a withering kingside attack; Alex Combie's complex position resolved itself into a loss; and Will Place got into a tangle after a successful opening and ended up losing. Trailing 3–0 after three hours' play was bad enough, but to make matters worse I had made a mess of a won position and was losing, while Brian Thompson's game was also bad. Only Rob Richmond seemed likely to score. But then the tide turned. My opponent seemed committed to creating severe time trouble for himself, and a succession of errors cost him first the advantage and ultimately the game – a 15 minute think after the time control was reached led him to resign. A couple of minutes later Rob forced resignation, so attention turned to Brian's game. It looked as though he might hold the draw, but his opponent played inaccurately until a position was reached in which Brian had R + N + P vs. R + 3P, with the enemy king confined to the back rank. 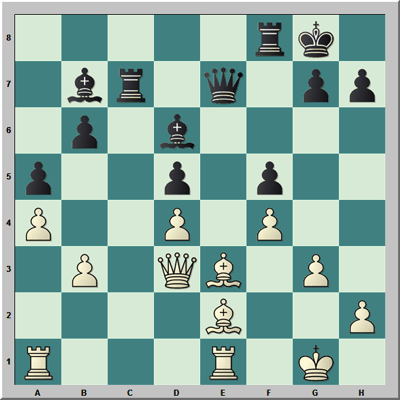 There were winning chances, based on a mating attack, but if White could exchange off the last black pawn these would evaporate. Sure enough, a chance to do that arose, but White tried an alternative route and ended up losing all three pawns. Brian duly converted to save the match. The second team were evenly matched against Halesowen. Prospects looked very good after Bob Taylor secured a draw against a strong opponent, and were made even better when Robert Willoughby won on Board 6. Although Neil Graham was clearly in trouble, Stan Cranmer had drawn and Richard Myers and Maurice Hill were both on top. Unfortunately, neither of these two could force the win, and Neil's defeat resulted in another 3–3 draw. Round 6 took the opposite course for the first team compared with the previous day. After a couple of hours it looked as though we might score a big win: I had a big advantage from the opening, Will's opponent was sacrificing unsoundly, David had a clear advantage, and nobody else seemed worse. But this time everything swung against us. Alex could only draw, while I missed a tactical point and turned a likely win into a loss (ending a 19 game unbeaten run in the 4NCL – not the best moment to do it). Meanwhile, Will was two pieces up but finding his opponent's pair of advanced passed pawns awkward to deal with. Andy Walker reached a level rook ending and drew, but Rob's position turned nasty. Our best hope seemed to be David's game, where he reached a B vs. N ending with an extra pawn. Sadly, the enemy pieces proved to be well coordinated and the win was not to be found. Will did eventually neutralise the enemy pawns, but Rob's defeat condemned us to a narrow loss. Nottinghamshire 2 received an unkind draw, facing the mostly young players of AMCA Rhinos. The average rating difference of 61 points per board was probably somewhat greater in reality. Ratings aren't everything, though. Brian seemed to be inspired by his heroics of the previous evening and won convincingly, while Bob registered another solid draw. Neil was in trouble again, but Robert had reached a won ending when disaster struck, a simple blunder costing him the game. Richard and Stan had drawn, but Neil was left trying to hold an endgame the exchange down, which turned out not to be possible. A draw was a good result in end though. The penultimate weekend of the season was not, one would have to say, our finest hour. But let’s beginning with the good bit. Nottinghamshire 1 delivered the expected result against a weak Mind Sports team. I had the good fortune to be playing an opponent with an ECF grade of 78, which meant a very quick 1–0 lead. Robert Richmond followed with another win inside two hours. There were a couple of nervous moments before the win was confirmed, most notably when Richard Truman overlooked a knight fork in a good position. Fortunately he had a decent reply that led to a draw. Andy Walker reached an endgame with two rooks against a queen which the computer says was significantly better for him, but with passed pawns for both players it was not that easy for mere humans to assess. Tim Walker's match-winning draw came in a sharp-looking position following a knight sacrifice that gave him an advanced c-pawn. The only sensible assessment of the position is 'unclear'. Last to finish was David Levens, whose opponent generously gave him a 50 minute start on the clock. So that left Maurice Hill with a reasonable position and Alex Combie with something that looked rather unclear. Maurice quite reasonably took a draw, but Alex's position drifted steadily downhill before a big mistake in a lost position cost huge quantities of material. Richard survived some pressure to chalk up a draw. I bluffed my opponent into a dubious rook ending instead of a drawn pawn ending and won again, at which point I went off to the analysis room confident that Will's beautiful bishop pair and extra pawn would win the match. Although Alex was in trouble, David's position looked no worse than drawn. Half an hour later I returned to find that Alex had lost, as expected. What I didn't expect to see was Will two pawns down and about to lose a third, while David had also dropped a pawn. Sadly, there were no miracles to be had, and yet another 3½–2½ defeat – our fourth of the season – was registered. So could Notts 2 bounce back? Unfortunately, there was bad news even before play started. Maurice, despite feeling unwell, had made the journey to the venue, but was too ill to play. It may not have been a wise decision to make the trip, but the effort was appreciated. At the board, Bob did reverse his Saturday result (a typical result against a stronger opponent), but no one else could score a full point. Richard Myers and Robert Willoughby, fresh (if that's the word) from the MCCU U125 final on Saturday, both drew, as did Stan. Neil's dreadful season continued, resulting in a narrow defeat. There’s a certain inverted logic about perverse results: fielding our strongest team since the opening weekend, and with almost 100 points per board advantage, Nottinghamshire 1 quite naturally slumped to the worst defeat of the season, losing 4–2 to FCA Solutions 2. Of course, average ratings don’t tell the whole story. Most of our advantage was on Boards 1 and 6, but the other four were evenly balanced. I found stiff resistance at the bottom end, but an oversight by my opponent allowed a quick finish. In the diagram, White has just played 22.f4? to counter the threat of ...f5, although that’s not too dangerous. I was sure there was something for me here, but efforts to make 22...Re8 or 22...Bb4 work were inconclusive. Finally, almost in desperation, I looked at 22...Ba6!, and all became clear: White must lose material. 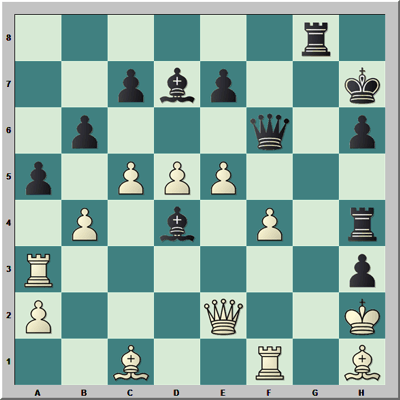 The game ended 23.Qxa6 (23.Qd2 Bb4 24.Bxa6 Bxd2 25.Bxd2 Qf6 is also fairly straightforward) 23...Qxe3+ 24.Kg2 Bb4 25.Rf1 Rc2 26.Rf2 Re8 0-1. But that, unfortunately, was the high water mark. David Levens lost after trying too hard to win; Pete Mercs saw what appeared to be a nice position drift into unpleasantness and also lost; and yet another unfathomable Rob Richmond effort petered out into a draw. With a solid draw from Andy Walker, Richard Truman’s game became critical, but by this point winning was out of the question. An attractive attacking position yielded no more than an endgame in which Richard had three pawns for a sacrificed piece, but his opponent was able to chip away at the pawns while avoiding losing his own. Richard finally capitulated well into the final hour of play. Much better news, however, for Nottinghamshire 2. Facing the AMCA Hippos, Robert Willoughby posted a straightforward win, although this was soon offset by Neil Graham’s defeat. Alex Combie scored a steady draw on top board, but things were a little unclear on the remaining boards. Bob Taylor’s opponent arrived 45 minutes late, but such disadvantages mean little to juniors. In the end, Bob weathered the storm successfully, finishing with an extra piece. Maurice Hill’s game went through a tactical interlude with errors on both sides, but he finally emerged with a piece for two pawns and had no difficulty securing the win. With the match won, it remained only for Brian Thompson to turn his pressure into a win, which he duly achieved after his opponent cracked just before the first time control. Notts 1 resumed normal service with yet another 3½–2½ defeat against Iceni – very beatable opposition. Richard’s marathon effort on Saturday may have contributed to his rapid loss, but the English language lacks an appropriate adjective to describe the disaster, so I’ll just say ‘horrible’ and leave it at that. In any case, it shouldn’t have mattered: I won a clean extra pawn, David had what looked like a straightforward technical win, and Andy was well on top. Brian dropped a pawn but held the ensuing rook ending easily enough, while Rob also drew. But then it all went pear-shaped. I missed a knight fork and was relieved to be offered a draw in a worse position and Andy let his advantage slip, which left David to save the match. Unfortunately a single oversight had turned his comfortable win into a desperate struggle to save the game. He managed it, but that was all. Notts 2, however, were making hay against Littlethorpe 3. Stan Cranmer raced into a won rook ending while most of us were still in the opening. Robert won quickly and Neil drew, but although Alex held an advantage both Bob and Maurice were struggling. It didn’t seem to matter though: Maurice’s opponent mishandled the clock and simultaneously blundered and overstepped the time limit, Alex converted his queenside pressure into a win, and Bob held on to draw a pawn down, resulting in a 5–1 win that also saw Notts 2 jump above the first team in the table. The final ignominy – Nottinghamshire 1 not only finished up behind the second team, but actually slipped further behind. It was gruesome stuff: despite a 200 points per board average rating advantage, with a significant difference in our favour on every single board, we were lucky to escape with a 3–3 draw. Alex had no trouble despatching his young opponent, but on top board Rob’s king was being frog-marched all over the board in an apparently forlorn attempt to avoid calamity. Rob resigned, but Fritz thinks that the position might actually have been slightly better for him! Richard made a finger slip that saw him staring down the barrel, and Brian dropped an exchange for nothing. My opponent played the very odd 1.d4 Nf6 2. c4 e6 3.Nc3 d6, so I was making things up from scratch very early on. Fortunately for me there was no cunning master plan behind Black’s setup. By now, David was facing a speculative exchange sacrifice. He defended carefully and at one point was actually winning, but the chance and the game slipped away. At 2–2, with bad positions on the remaining boards, we were braced for the worst, but Richard’s opponent got his move order confused and dropped a piece. And then, just for a moment, it seemed that Brian might somehow wriggle out. His opponent didn’t seem to know how to use his material advantage, and reached both the first and second time controls with seconds to spare. It wasn’t quite enough though – a last ditch stalemate trap failed, and that was that. Meanwhile, the (relatively) high-flying Notts 2 eased to a very comfortable 4–2 victory against Bristol 2. Robert had an easy win on bottom board and Maurice and Stan took steady draws. Bob did his customary job on Board 1, holding a much higher rated opponent to a draw. This effectively secured the match as both Will Place and Richard Myers were pressing for victory in rook and pawn endings. Will duly converted his, but Richard finally had to concede the half-point. The final table on the 4NCL web site shows that Nottinghamshire 2 finished 18th (of 32 teams) with 10 points, while Nottinghamshire 1 were 23rd with 8 points. These positions are a little misleading – Notts 1 scored 34½ game points (out of 66) whereas Notts 2 scored just 30; and Notts 1 also faced much stronger opposition. But losing five matches by a 3½–2½ margin was hugely frustrating. I’d like to thank all the members of the squad for making my life as captain particularly easy. Particular thanks go to the drivers, who took care of practically all of the detailed travel arrangements and were as flexible as ever when asked to go out of their way. For personal reasons I am reluctantly relinquishing the captaincy – I can’t commit to all five weekends for 2009–10. I trust that my successor will have a little more luck with results!